The term ‘mid-life crisis’ was a euphemism for mental breakdown because I wasn’t ready to announce a breakdown to the world. I was hoping it would go away before anyone noticed. But my depression did not budge, as these things won’t when you try to bury them. I’ve now learnt the more you try to deny an emotion the more stubbornly it will cling to you, but at the time I didn’t know that and I was pretty desperate to make sure that my dear friends, family and readers didn’t find out I was depressed. A fact I tried to hide until week 11. I wasn’t recovering from depression because that’s easier to talk about. Everyone has a problem they’ve recovered from; I was submerged in this one. My depression was an ongoing problem, one I would have liked to hide but couldn’t so I learnt how to people tell people the truth about yourself. For 52 weeks I wrote about my depression as I tried a different exercise every week because I had to, not because I wanted to. I shared it because my depression and breakdown were tied to feelings of inauthenticity around being the founder of Get In the Hot Spot, a personality who inspired people in their forties and above to be more adventurous and have more fun, when secretly I felt useless and despondent. The physical exercise in the 52 Exercises quest didn’t help me recover from depression as much as the mental exercise did. That included organising, doing and blogging about a different exercise each week as well as therapy, meditation and mindfulness. There was lots of writing (most of which wasn’t published on the blog) as I tried to make sense of what was happening to me and how my experiences could help you. The story ends here in a break down of the 52 exercises I tried, with one exercise tested and covered every single week in 2013. Some exercises were almost cop outs and physically undemanding like bat and ball, but a lot of the exercises, like body building and an obstacle race, pushed me to my limits. Although the more obviously challenging exercises tended to get more blog post comments and views than less strenuous exercises, I often I learnt as much in the weeks where I didn’t push myself so hard as in the weeks that I did. I hope you can learn something from reading about my experiences and journey from depression to buoyancy. I hope it makes you laugh and cry as it did me. Most of all I hope it let’s you know that if you’re depressed you are not alone and if you’re going through a tough time it won’t last forever. Badminton – Is it Time to Quit? I’m feeling so much better now. I think I’m calmer, wiser and kinder. More the kind of person I’d like to be. I’m not perfect and I know I never will be but I can live with that now. I’ve proven that you can change at 40 or older, I’m still working on myself and I’m excited about the future. If you’re interested in positive change too I’ve introduced a new series called How to Embrace Change at Any Age which is only available by email to email subscribers. It’s free – sign up here now if you’d like to start making life changes, stay flexible or cope better with change when it happens. This whole experience and journey has taken me from feeling restless to feeling settled. I’ve still got some amazing travel plans for the year ahead but the travel is less of a driving urge to run away and more of an added bonus on a life that’s really pretty amazing. I’ve travelled around the world searching for happiness and inner peace for the last 27 years but I’ve realised those things will only ever be temporary. You can touch them but you can never hold onto them for ever. And I’m okay with that too now I’ve finally come home to myself. Have you ever had a mental breakdown or been through tough times and come out better for it? Your support, encouragement, emails and blog comments have helped me keep going when everything seemed hopeless. You being here has helped me know that I wasn’t really alone, even when I felt mired in loneliness. Thank you for reading Get In the Hot Spot, being here with me on this journey and making it all worthwhile. Have you Subscribed Yet? It’s Free! Get a weekly injection of tips to help you be more adventurous, have more fun and feel fabulous in your forties and beyond in our newsletter. Click here and subscribe now for free updates, unique lifestyle tips that you can’t find on the blog and links to the best stories. Gosh that’s an amazing transformation in thinking. So glad you are feeling more settled too. your biggest journey has been through your own mind and I salute you for that, because, surely, it is the scariest one we ever make. I’ve enjoyed following your series and I have laughed for you and wept for you, and, truly, I hope you have come to rest in a better place. My goodness, it’s hard to believe it’s been a whole year! You’ve accomplished so much on so many levels. Thank you for your openness and honesty and all the wild exercises you share to help us all stay fit in body, mind, and soul. Thank you Sandra, I think we’ve all accomplished a lot – it’s good to recognize that for a change instead of just thinking it wasn’t enough. Yes, and definitely yes…. some major and some minor but each period of pain does end and there’s always wisdom to be gained….. Am a firm believer in asking for help and being humble… and grateful for the help that’s there. Your series has been a pleasure to read and an important part of last year for me. So good to hear you have the new series. Yes, the new series will be by email only though but I know you’re a subscriber so that’s great. 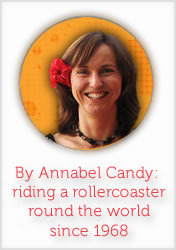 This is an amazing journey you have been on Annabel and I salute you for writing honestly about it. Many women will gain strength through this knowing that they are not the only ones going through what you have just been through. Congratulations on your incredible accomplishments. This is fan bloody tastic… What a brilliant article!!! Hi, thanks for sharing a great post, i’m sure most of your readers who are at least in their mid life crisis can relate to this. Zumba is something great which i do three times a week and it gives me a different kind of energy which helps me a lot. Really great! I’m sorry to hear that you were depressed, and I’m awed that you attempted and achieved such a huge goal while in the thick of it. Reading your post today (not this one, the one that came in on 19 Jan, 2016), I thought of someone who might be able to help you put the book together. Her name is Natasa Denman, and she has a book/course called Ultimate 48 Hour Author. From the title, I t sounds like it could be a scam, or other really dodgy copout but I’ve heard her interviewed, I have the course (and I dream of doing her retreat), and it is just a really neat way of getting organised and then dictating your already compiled notes. To me, it sounds like you might be a good fit. I’m not an affiliate for Natasa, but if you decide to contact her, I’d love it if you mentioned my name. Best of luck with all of your future endeavours, I’ve really enjoyed reading your posts.